Sometimes it’s good to take a step back and remember how things started. Roast chicken and vegetables was one of the first complete meals I cooked my family at the grand old age of 12. I felt so grown up then, and super happy to have plated up a complete meal to my family. I don’t know if Mum appreciated it as much. I have a feeling I made a mess of the kitchen. She was nice about it, though, and so the tradition of my cooking one main meal a week (complete with sides) began. 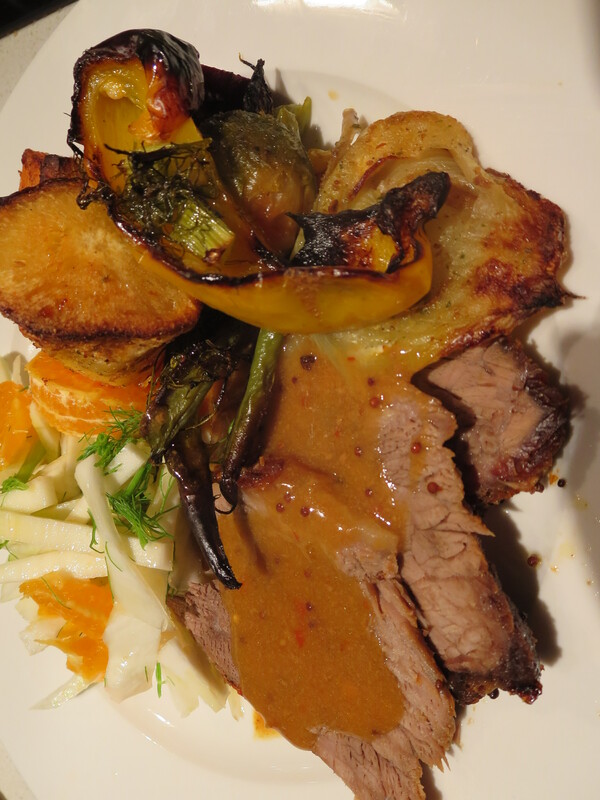 This is obviously not the same roasted vegetables as I had prepared way back when, but the evolution of the dish. This is more of a general idea rather than a specific recipe. The vegetable you use will depend entirely on what you have at home, and what you like to eat 😛 Sometimes, I may roast potatoes alone, with just some salt and pepper. Other days, it will be more like above, and I throw things together and hope for the best. Incidentally, it was a delicious experiment. There are a couple of things that you should remember. Firstly, do not overcrowd the pan, It will stew rather than roast if there is no room for the air to circulate. Secondly, use enough oil to give all the vegetables a light coating, but not so much so that they are swimming in oil. I use a pastry brush to do this. Remember to cut your root vegetables into even sized pieces. As I find potato takes longer to cook than pumpkin and sweet potato, I tend to cut these slightly smaller than the sweet potato and pumpkin. Also beetroot, which can take a bit longer to cook than other vegetables of a similar size, is another vegetable that should be smaller than its friends in the cooking tray. I always cut these into much smaller pieces than the potatoes, sweet potatoes or pumpkin. I always salt this dish before cooking, but you can leave this out if you wish. VARIATIONS: You are limited only by your imagination. Don’t just roast potatoes, try cauliflower, pumpkin, zucchini, carrots, even sweet corn! Instead of brushing with plain oil, you could make a mixture of melted butter and oil (I use olive on its own), or cooking spray. As far as seasoning the roast, the sky is the limit, but here are a few of my favourite combinations – Add 1/2 to 1 teaspoon of smoked paprika to your oil before brushing over vegetables and sprinkle some extra over the vegetables just before serving; sprinkle vegetables with salt, lemon rind and lemon pepper before roasting; add 3 or 4 lightly crushed (unpeeled) garlic cloves to the roast after the first 20 minutes has passed, with some rosemary (lovely with a roast lamb); 1 to 2 teaspoons of cumin powder mixed into your oil before brushing over vegetable (very good with roasted cauliflower). Preheat the oven to 180 °C (355 °F). 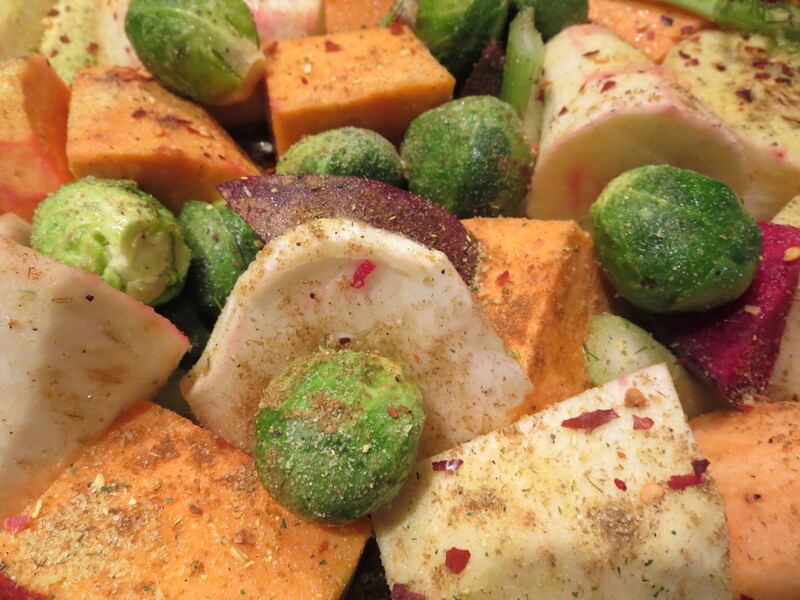 Place the sweet potato, parsnip, beetroot, fennel bulb , red onion and brussel sprouts into your baking tray. Using your pastry brush, brush the oil over the vegetables, reserving 1 tablespoon. Sprinkle with the chilli flakes and cumin powder, salt and pepper. 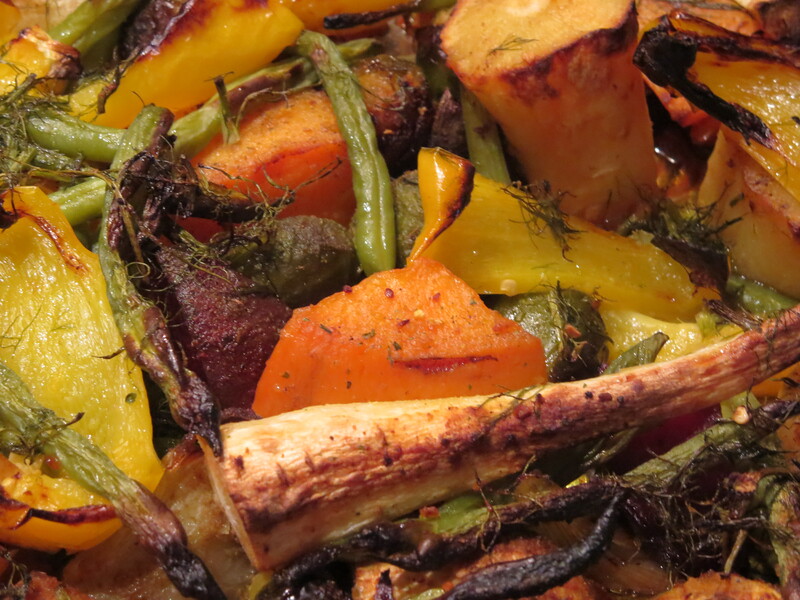 Toss the vegetables, then roast for 40 minutes. In the meantime, toss the reserved fennel top, beans and capsicum with the reserved oil. Once 40 minutes has elapsed, add the quicker cooking beans, fennel top and capsicum to the rest of the vegetables, making sure to mix well so that the flavours are well incorporated. Return the try to the oven and cook for a further 25 minutes or until done to your liking. Serve alongside your favourite roast, with or without gravy. Enjoy!